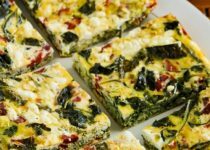 This frittata is loaded with low carb ingredients without having to sacrifice taste. Wash Kale if needed, and spin dry or dry with paper towels. Heat the oil in a frying pan on medium high. When the oil is hot, add kale and sauté until it's softened in a flat layer, about 2-3 mins. If using a slow cooker spray well with non stick spray so ingredients do not stick to cooker. Drain red peppers and chop into fairly small pieces. Slice the green onions and crumble the feta. Add the chopped peppers, onions to the slow cooker with the kale. Beat the eggs well, whipping in the Garlicky Italian Seasoning and black pepper before pouring over other ingredients in the slow cooker. Stir until all ingredients are well combined. Sprinkle feta cheese on top. Cook on low 2-3 hours, or until the frittata is well set and cheese is melted. Serve hot, with a dollop of sour cream if desired or more feta. Excellent served with a simple side of salad greens dressed with Garlic & Dill Dressing. Note: will keep in fridge for several days and can be reheated with a microwave if desired.